The rate and number of out-of-school children are strongly correlated with national income: in poorer countries, more children are out of school than in wealthier countries. The World Bank classifies all countries according to their gross national income (GNI) per capita (World Bank, 2017). The map in Figure 1 shows the distribution of countries by income level according to the July 2016 classification. Low-income countries with the lowest per-capita income are concentrated in sub-Saharan Africa. Figure 2 shows that the out-of-school rate decreases with increasing national income. Low-income countries have, on average, the highest out-of-school rates, according to estimates by the UNESCO Institute for Statistics. 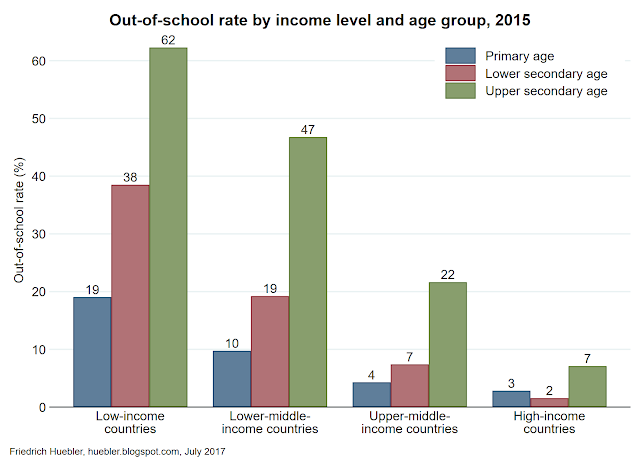 19% of all children of primary school age (about 6 to 11 years) are out of school in low-income countries, compared to only 3% in high-income countries. Among adolescents of lower secondary school age (about 12 to 14 years), more than one third (38%) are out of school in low-income countries. The average out-of-school rate is highest for youth of upper secondary school age (about 15 to 17 years) living in low-income countries: nearly two thirds (62%) are not in school. The correlation between national income and exclusion from education can also be demonstrated with national data. Figure 3 plots GNI per capita against the primary out-of-school rate. The highest out-of-school rates are observed among countries with the lowest per-capita income. South Sudan, one of the poorest countries, has the world's highest primary out-of-school rate, with 69%. 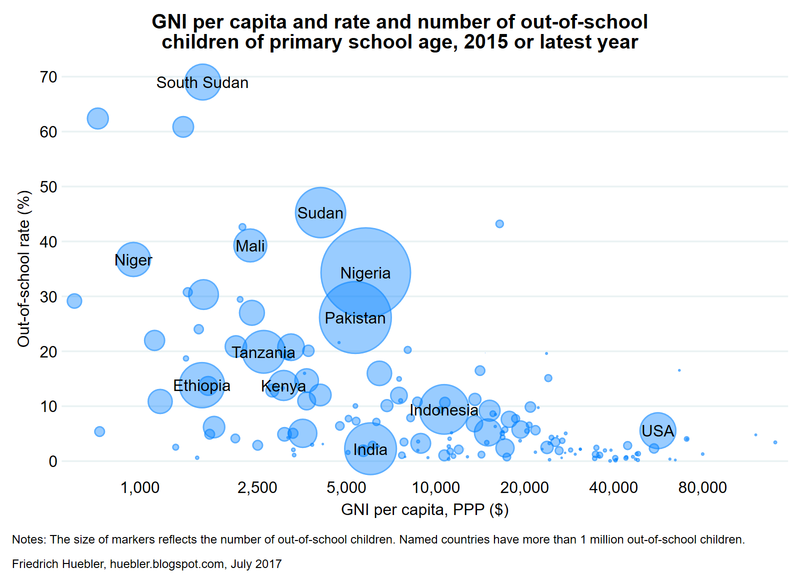 The absolute number of out-of-school children, indicated by the size of the markers in Figure 3, also tends to be higher in countries with lower national income. The three countries with the largest number of out-of-school children – India, Nigeria and Pakistan – are in the lower-middle-income group of countries. The United States of America stands out as a high-income country with a relatively high rate and number of out-of-school children, but analysis by the National Center for Education Statistics shows that the majority of these children are being homeschooled (Redford et al., 2017). A recent policy paper by the UNESCO Institute for Statistics and the Global Education Monitoring Report (UIS and GEMR, 2017) examines the link between education and poverty. The paper concludes that reaching the Sustainable Development Goal of universal primary and secondary education could reduce the global poverty headcount (measured by the number of persons living on less than $1.90 per day) by more than 420 million, or more than half of the current number. Redford, Jeremy, Danielle Battle, and Stacey Bielick. 2017. Homeschooling in the United States: 2012. Washington, DC: National Center for Education Statistics, Institute of Education Sciences, U.S. Department of Education. https://nces.ed.gov/pubsearch/pubsinfo.asp?pubid=2016096rev. UNESCO Institute for Statistics (UIS), and Global Education Monitoring Report (GEMR). 2017. "Reducing Global Poverty through Universal Primary and Secondary Education." Policy paper 32/Fact sheet 44. Montreal and Paris: UIS and GEMR. http://unesdoc.unesco.org/images/0025/002503/250392e.pdf. World Bank. 2017. "How Does the World Bank Classify Countries?" World Bank Data Help Desk. Accessed 25 May. https://datahelpdesk.worldbank.org/knowledgebase/articles/378834-how-does-the-world-bank-classify-countries. The rundo and rundolines programs for integrating Stata with an external text editor were updated to version 5.1. The programs are compatible with Stata 15, released in June 2017, and Stata 14, released in April 2015. Users of older versions of Stata can install rundo and rundolines version 4.1. The user guide for the rundo and rundolines programs was also revised. The table on the highest completed level of education in the UIS Data Centre also presents the percentage of the population that has no formal schooling and that has incomplete primary education. For the first time, the UIS is offering time series with data on educational attainment, covering the years 1995 to 2015. Previously, data on the highest and minimum completed level of education were only available for the most recent year. In total, educational attainment data are available for 147 countries and territories. 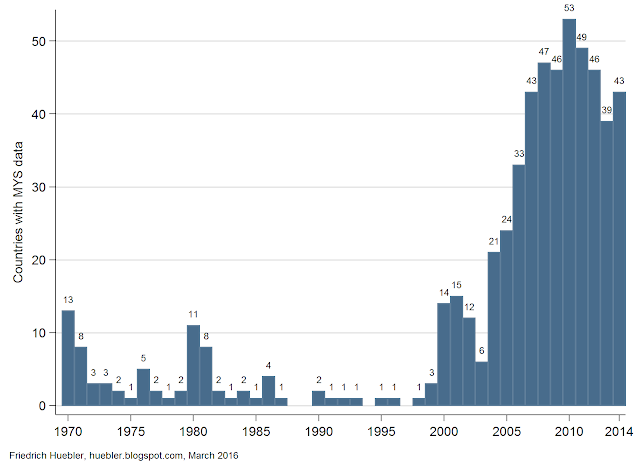 The number of countries with data for a given year is shown in Figure 1. For example, 74 countries have data for 2010 and one country (Mali) has data for 2015. Portugal has data for 17 years, South Africa has data for 11 years, other countries have data for fewer years. 35 countries have data for only 1 year. Estimates of mean years of schooling, i.e. the average number of completed years of education, are derived from data on educational attainment and were first released by the UIS in December 2013. The estimates were updated in March 2015 and then again with the most recent release, in February 2016. The UIS Data Centre now presents mean years of schooling for 149 countries and territories for the period 1970 to 2014. Figure 2 shows the number of countries with data on mean years of schooling per year. 53 countries have data for 2010, more than any other year. The countries with the best coverage are South Africa with data on mean years of schooling for 16 years, Spain with data for 13 years, and Mexico with data for 11 years. 45 countries have data for only 1 year. In September 2015, the United Nations General Assembly adopted a set of 17 Sustainable Development Goals. Goal 4 calls for "inclusive and equitable quality education and lifelong learning opportunities for all". The first of the 10 targets within SDG 4 is: "By 2030, ensure that all girls and boys complete free, equitable and quality primary and secondary education leading to relevant and effective learning outcomes". The SDGs are the successor to the Millennium Development Goals that were adopted by the United Nations in 2000 and called, among other things, for universal primary education by 2015. Data by the UNESCO Institute for Statistics (UIS) show that the education MDG has not been met. 124 million children of primary and lower secondary school age were still out of school in 2013, the latest year for which reliable estimates are available. 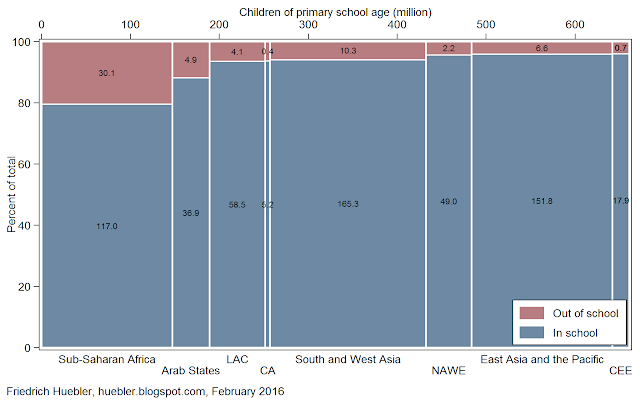 Among children of primary school age, the global out-of-school rate was 9%. Among adolescents of lower secondary school age, the global out-of-school rate was 17%. School ages vary from country to country but on average the official primary school age is 6 to 11 years and the lower secondary school age 12 to 15 years. The global numbers hide large regional disparities. Figures 1, 2 and 3 show the distribution of the global school-age population in 2013 according to the regional classification used by UNESCO. UNESCO regions are virtually identical to the regions used for monitoring of the Education for All goals. Figure 1 shows the number of children of primary school age by region. 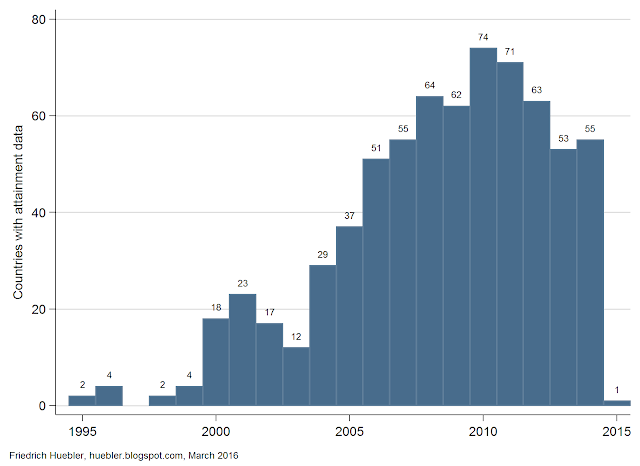 The number of children is plotted against the horizontal axis. For example, 176 million primary-age children lived in South and West Asia in 2013, 158 million in East Asia and the Pacific, and 147 million in sub-Saharan Africa. The global number of children of primary school age was 660 million in 2013. The proportion of children within each region who were in school or out of school is plotted against the vertical axis and the regions are arranged in order of the out-of-school rate. The numbers on the blue and red areas indicate the regional number of children in and out of school. For example, of the 147 million children in sub-Saharan Africa, 20% or 30 million were out of school, a higher percentage than in any other region; 80% or 117 million were in school. The Arab States were the region with the second highest out-of-school rate (12%). The region with the lowest out-of-school rate was Central and Eastern Europe, where 4% or 0.7 million of the 18.6 million children of primary school age were out of school in 2013. Abbreviations: CA Central Asia, CEE Central and Eastern Europe, LAC Latin America and the Caribbean, NAWE North America and Western Europe. 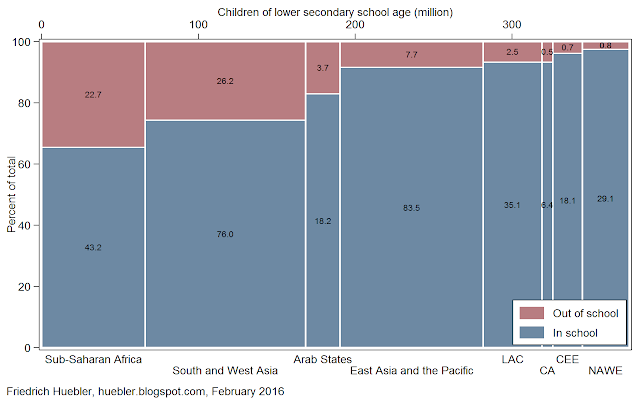 Figure 2 shows the regional distribution of adolescents of lower secondary school age in 2013. Of the 374 million lower-secondary-age adolescents globally, 102.3 million lived in South and West Asia, 91 million in East Asia and the Pacific, and 66 million in sub-Saharan Africa. 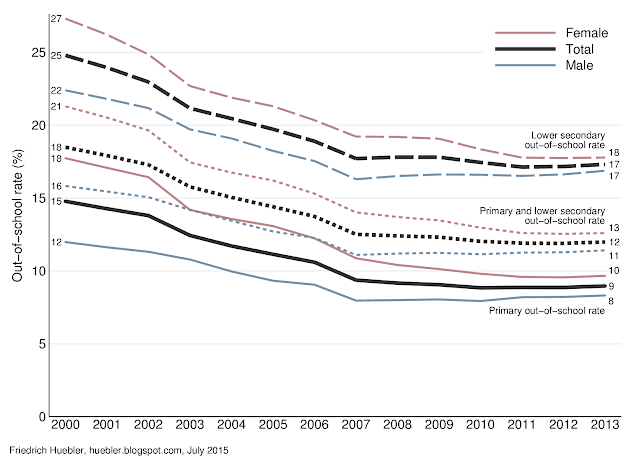 The global population of lower secondary school age is smaller than the population of primary school age but lower secondary out-of-school rates were much higher in 2013 than primary out-of-school rates. Sub-Saharan Africa was the region with the highest lower secondary out-of-school rate (34%), followed by South and West Asia (26%) and the Arab States (17%). Whereas sub-Saharan Africa had the highest number of primary-age children out of school, South and West Asia was the region with the largest number of out-of-school adolescents of lower secondary age (26 million), followed by sub-Saharan Africa (23 million). Lastly, Figure 3 shows the regional distribution of the population of primary and lower secondary school age combined. The global school-age population was greater than 1 billion in 2013. Of that number, 241 million lived in South and West Asia, 235 million in East Asia and the Pacific, and 160 million in sub-Saharan Africa. The combined out-of-school rate for children and adolescents of primary and lower secondary school age was 12% at the global level. The regions with the highest out-of-school rates were sub-Saharan Africa (25%), the Arab States (14%), and South and West Asia (13%). The lowest out-of-school rates (4%) were observed in North America and Western Europe, and in Central and Eastern Europe. In absolute terms, the regions with the largest out-of-school populations in 2013 were sub-Saharan Africa (53 million), South and West Asia (37 million), and East Asia and the Pacific (14 million). New estimates by the UNESCO Institute for Statistics (UIS) show that approximately 124 million children and adolescents were out of school in 2013. Of this number, 59 million were of primary school age and 65 million were of lower secondary school age. The entrance ages and durations of primary and lower secondary education vary between countries, but primary school age is typically 6-11 years and lower secondary school age is typically 12-15 years. The estimate for 2013 represents a decrease by 72 million from 2000, when about 196 million children and adolescents were out of school (see Figure 1). Most of this decrease occurred between 2000 and 2007 but since 2007 there has been hardly any progress in reducing the global out-of-school population. In the most recent period there was even a slight increase in the number of out-of-school children and adolescents. The primary and lower secondary out-of-school rates in 2013 - the percentage of children in these age groups who were not enrolled in primary or secondary education - were 9% and 17%, respectively (see Figure 2). Adolescents of lower secondary school age were thus nearly twice as likely to be out of school as children of primary school age. For the combined population of primary and lower secondary age the out-of-school rate was 12% in 2013. The trend in the out-of-school rate mirrors the evolution of the number of out-of-school children and adolescents. In 2000, the primary out-of-school rate was 15% and the lower secondary out-of-school rate was 25%. Like the number of out-of-school children, the out-of-school rate fell steadily until 2007 and has remained at nearly the same level since then. In spite of the lack of progress towards lower out-of-school rates and numbers in recent years, the gap between boys and girls has continued to decrease. At the global level, girls are still more likely to be out of school than boys but the difference between the female and male out-of-school rates fell between 2000 and 2013 from 6 percentage points to 2 percentage points for primary-age children and from 5 percentage points to 1 percentage point for lower-secondary-age adolescents. Because of the lag between the collection of national enrollment figures and the release of global out-of-school estimates by the UIS the number of out-of-school children and adolescents in 2015 is not yet known. Nevertheless, it is already clear that the Education for All goal and Millennium Development Goal of universal primary education by 2015 cannot be reached. A joint fact sheet by the UIS and the Education for All Global Monitoring Report contains more detailed analysis of the most recent out-of-school data and explains that current international aid for primary and secondary education is insufficient, especially for the world's poorest countries.